Windows 10 is to get a new feature which will allow users to run potentially suspicious apps in a sandbox environment to protect their system from any possible malicious side-effects. 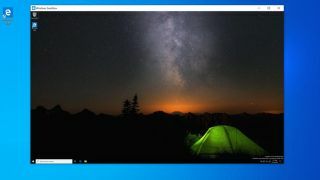 Windows Sandbox represents a convenient way to fire up a desktop environment which is completely isolated from the rest of your system, where you can run an executable which you’re concerned about without any fear of collateral damage. The sandbox is a temporary environment, and gives you security without having to go to the trouble of setting up a virtual machine. When the Windows Sandbox is shut down, any software and related files inside are completely deleted. Note that this feature is only coming to Windows 10 Pro and Enterprise, so it’s mainly aimed at businesses and professional users. However, there’s no telling if Microsoft might decide to slip it into other versions of Windows 10, like Home – or at least a similar temporary sandbox feature – in the future. Windows Sandbox also requires virtualization to be enabled in BIOS, and Microsoft is apparently set to roll out the feature to testers with build 18305, which should hit the fast ring soon. And that means it should go live for Windows 10 Pro users in the next big update set to land in the first half of next year.